Last night a party of 11 Smoky Joe Wood members watched as Rock Cats Stadium hosted the final night game in Rock Cats history. It was the penultimate home contest of the 20th and last season of the (AA) Eastern League team at this ballpark. The pregame marketing was all about Justin Morneau, who is on a rehab assignment from the Rockies. The former AL MVP did not disappoint this night. Present in the first 2 rows directly behind the plate (section 206) were Bill Ryczek, Paul Hensler, Steve Krevisky, Tom Monitto, Norm Hausmann, Tom Zocco, Rudy Urban, Karl Cicitto, and Larry Howard with his lovely family. Bob Wirz brought along friend Joe, who was the groundskeeper at historic Yale Field. Alan Cohen greeted us and then spent the game in the Press Box doing his job as a data stringer for MiLB. The Baseball highlights were even stronger. It was a picture perfect night. 6,429 packed the house. Rockies prospect Jeff Hoffman, a rookie who moved through A+ and AA this year, struck out 5 Portland Sea Dogs consecutively. Hoffman’s line for the night: 7 IP, 1 H, 1 BB, 1 R, 0 ER and 9 K’s. 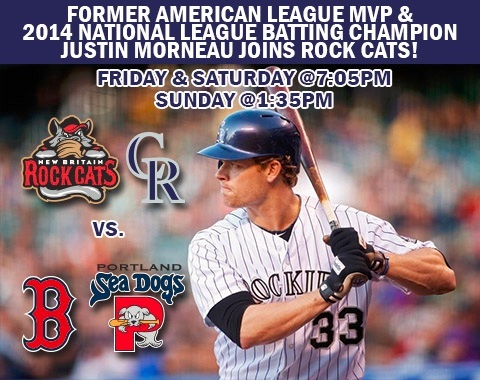 Justin Morneau provided the margin in this 2-1 Rock Cats victory. The native of Minnetonka, MN belted a towering homerun over the right field wall off Justin Haley in the 4th inning. Just one more dinger to go with his 88 in the minors and 241 in the bigs. The night ended on an odd note. Prior to striking out to end the game, Seadog Tim Roberson argued at length that he’d been hit by a pitch. Portland coach Billy McMillan soon joined the argument. The delay was a long one, giving fans time to formulate the chant, THROW HIM OUT! THROW HIM OUT!”. McMillan was then ejected. And Roberson fanned to end it. CHAPTER NOTES: It was decided that the next breakfast would move to Sept. 19, still at the Hamden Town House. The Oct. 24 general meeting has been moved to Middlesex Community College. See you on the 19th in Hamden.